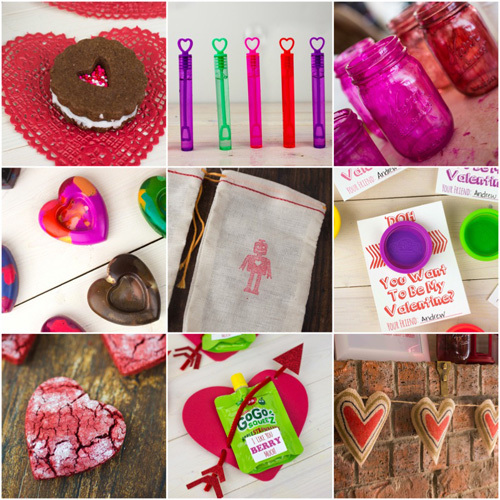 I’m sharing some of my favorite Valentine’s Day recipes and crafts over the next few weeks. 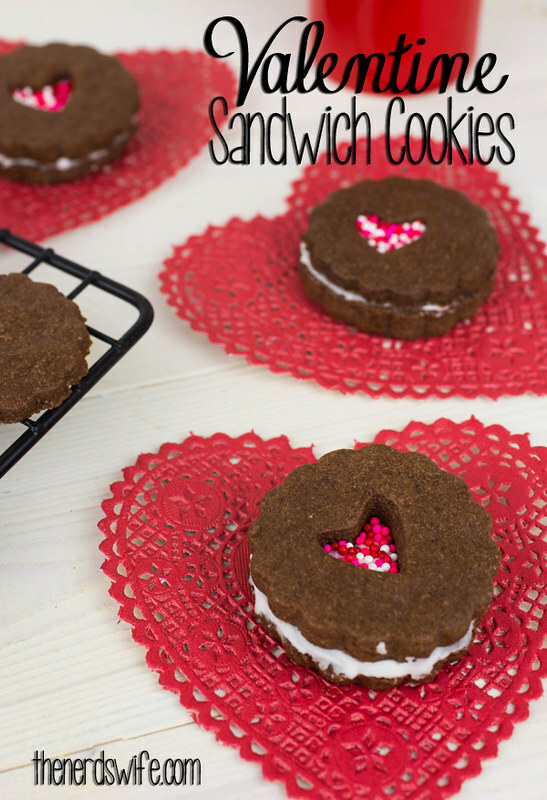 I made these Valentine Sandwich Cookies last weekend, and my son loved them. He even came into the kitchen to help me make them. I love recipes that kids can help with — he liked molding the dough and helping me roll in out with the rolling pin. The best thing about these cookies is how simple they are to make. 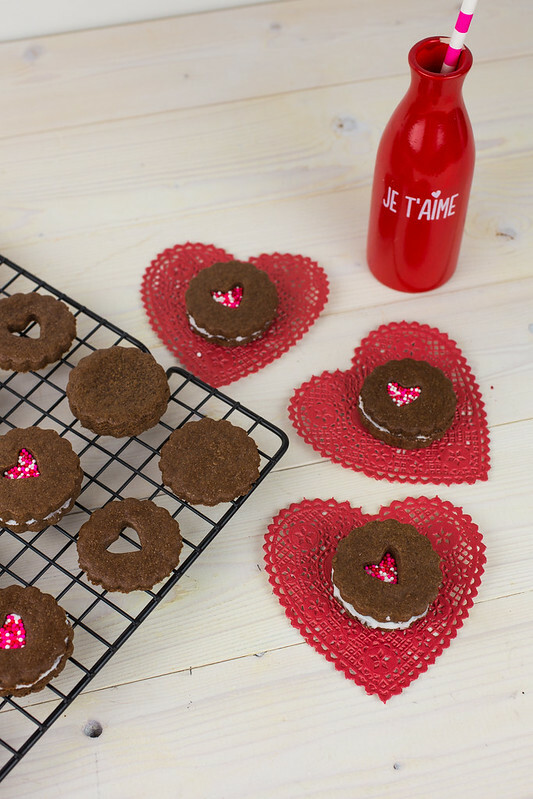 I used canned icing for the filling and fun Valentine’s Day sprinkles to give them a festive look. I love the way they turned out! In a large mixing bowl, whisk together the flour, cocoa powder, salt and baking powder. Set aside. In the bowl of a stand mixer, cream the butter and sugar together. Add in the eggs and vanilla extract. Turn the mixer on low and slowly add the dry ingredients until a dough is formed. The dough will be very sticky and difficult to roll out. Cover it and chill for at least one hour. Once the dough is ready, roll it out and cut it using a 1 1/2 inch cookie cutter. 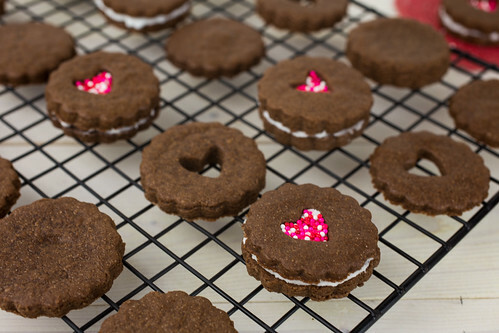 Using a small heart-shaped cookie cutter, cut a small heart in the middle of half of the cookies. Bake at 350 degrees F for 8-10 minutes. When done, allow to sit for a few minutes on the rack, then transfer to wire racks to cool completely. Spread buttercream icing onto one of the cookies and pair it with another that has a heart cutout. Add sprinkles into the heart opening for some extra fun. 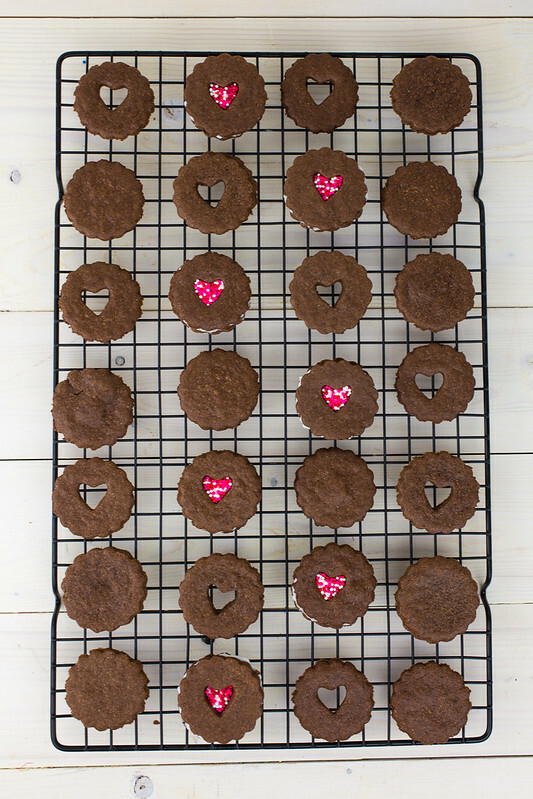 What are your favorite Valentine’s Day desserts?